Powers/Abilities: Although appearing to be middle-aged and a bit overweight, the wealthy Jonathan Bascombe was remarkably well-conditioned and was able to climb a "mountain" without breathing hard. Following his exposure to a "cellular shrinkage serum," Bascombe was reduced to the size of an ant. A cruel and mean-spirited man, Bascombe kept a glass case in his home that contained a mound of dirt and ants; he amused himself by watching the ants climb the mound, and when they reached the top, he would knock them back down with the tip of a pencil--metaphorically speaking, Bascombe treated people in much the same manner, and he delighted himself by denying their requests for financial assistance when they were in need of money. History: (Strange Tales of the Unusual#10/2 (fb) - BTS) - The past of Jonathan Bascombe is unknown, but over time he had accumulated a great deal of wealth. (Strange Tales of the Unusual#10/2) - One evening, Bascombe was at home, indulging in his favorite pastime--knocking ants down as they climbed a dirt mound--when he was visited by Max. Bascombe explained the odd game he was playing and told Max he found it amusing because the ants represented the weaklings of the world, the failures who never succeeded. Then Max revealed the reason for his visit--he had been working on a cellular project for years, and he was making real progress, but he needed money for the final stage of the experiment. For the sake of science, Max pleaded with Bascombe to lend him five thousand dollars so he could complete his work, but Bascombe refused. The next night, driven by the desire to say no to those less fortunate them himself, Bascombe drove his car through a gathering storm to the ramshackle house that served as Max's laboratory; he planned to make Max believe that he had reconsidered his request for money, just so he could have the pleasure of refusing him again. But Max was not at home, so Bascombe let himself in. 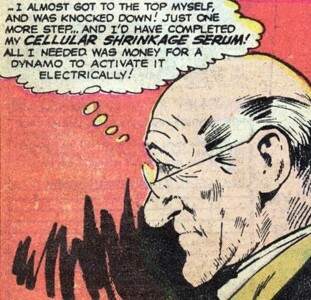 He glanced through Max's journal and read that Max had given up on his experiment because without a dynamo, there was no hope of completing his unspecified serum. Bascombe saw a flask upon a table and guessed it to be the serum the journal referred to, but just as he grasped the container, a bolt of lightning from the storm came through the window and struck the flask, and Bascombe was knocked unconscious. (Strange Tales of the Unusual#10/2 - BTS) - The lightning bolt had charged the serum with the needed energy and activated it, and Jonathan Bascombe had unknowingly been shrunken to the size of an ant. While apparently in a dazed state, the tiny Bascombe wandered outside of Max's lab until his senses returned when he was near a sand pile. 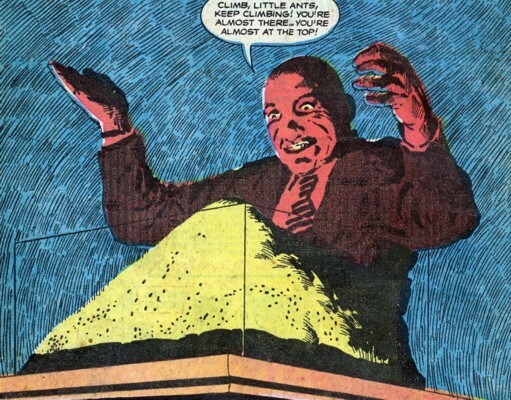 (Strange Tales of the Unusual#10/2) - Having lost track of time, Bascombe revived and found himself standing before a "mountain" (actually a sand pile). 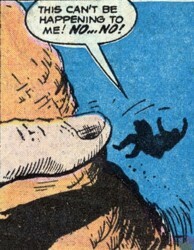 Determined to see where he was, Bascombe began to climb the mountain, but just as he reached the summit, a giant finger knocked him from the unattainable peak. Again and again he tried, always to be thwarted at the last moment by the huge digit, and over the sound of his own frustrated sobs, Jonathan Bascombe heard distant rumblings. 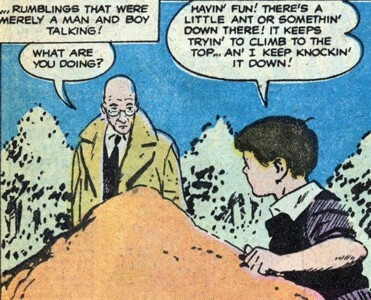 The rumblings were merely Max talking to a boy playing in a sand pile. Max asked the boy what he was doing, and the youngster explained that there was an "ant" (actually Bascombe) trying to climb to the top of the sand pile, and the boy was just knocking the ant back down for fun. 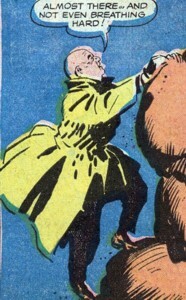 As Max walked away, he thought to himself that children could be so cruel, for Max could identify with the tiny "insect"--he had almost reached the top himself, but his experiment with his cellular shrinkage serum failed, for all he needed was to purchase a dynamo to electrically activate the serum, but Bascombe had refused to lend the money to him, so the elderly scientist would never know if his serum worked. It would appear that Max's experiment may be similar to the serum that would one day be developed by Henry Pym (@ Tales to Astonish I#27). An acquaintance of Jonathan Bascombe, Max was an elderly research scientist who had spent years trying to secretly develop a cellular shrinkage serum. 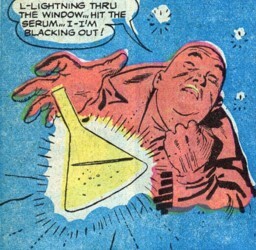 He was at the final stage of perfecting the serum, but he needed money to purchase a dynamo to electrically activate the chemicals. Max went to Bascombe to ask that he lend him five thousand dollars, but Bascombe denied his request. Bascombe was later shrunken to the size of an ant by Max's serum when it was struck by a bolt of lightning. As Max was later walking away from his lab, he noticed a boy playing in a nearby sand pile. The boy was knocking an "ant" off the pile as it reached the top, but the "insect" was actually the shrunken Jonathan Bascombe, and Max would never know that his serum had worked. This youngster was playing by a sand pile near Max's laboratory when he noticed an "ant" trying to climb to the top of the pile, so for fun he continuously knocked it down with his finger. He didn't know that the "ant" was actually Jonathan Bascombe, who had been shrunken by Max's serum.